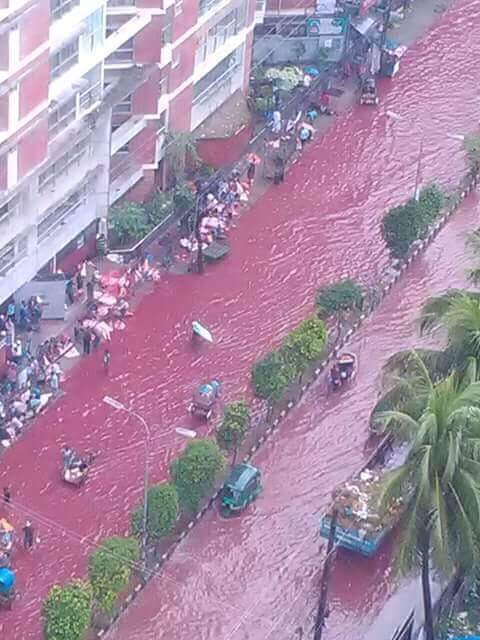 Flooded streets turn blood red; as they celebrate with animal sacrifices right there on the streets. But they will say that the water turned to blood consequent their Pagan animal sacrifice festivities. But I tell you to think. 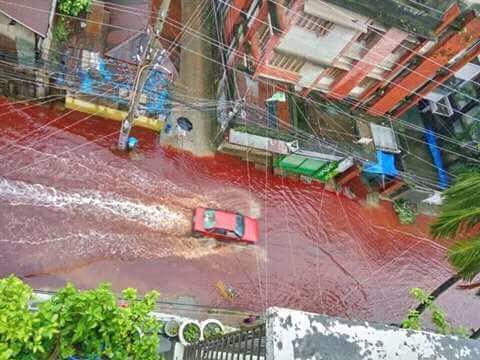 Count the animals by the pints of blood, then with a straight face you tell me that this whole land mass/body of water turned to this dark color of blood red. 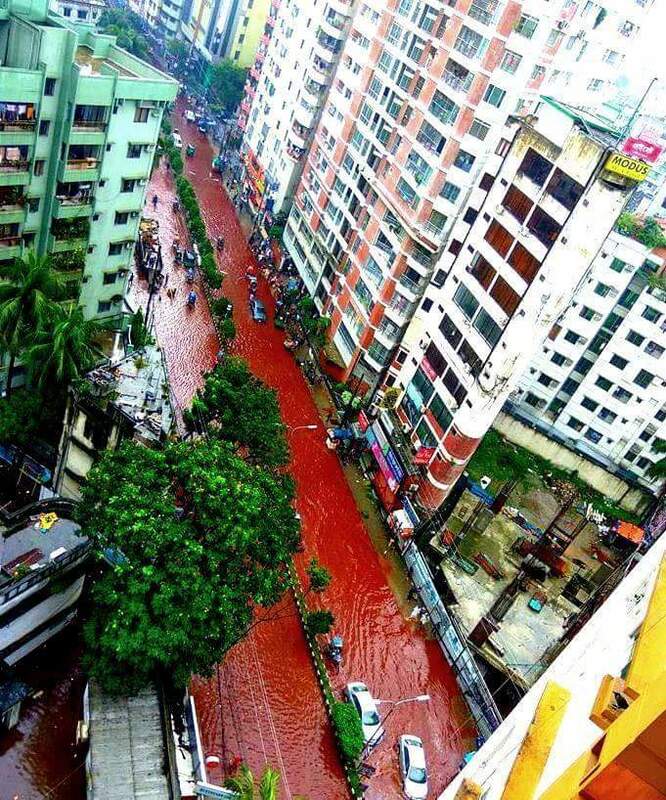 Maybe their animals blood must’ve trickled over to the other bodies of water that have also turned to blood…China, Mexico, Alaska, Australia, USA (except we call them Toxic Algae Blooms – since it sounds more believable), etc. Muslims around the world celebrated the Eid al-Adha holiday on Monday, one of the two most important festivals of the Islamic calendar. Marking the willingness of Ibrahim, or Abraham, to sacrifice his son on God’s command, Muslims mark the holiday by slaughtering animals such as sheep and goats. The meat is shared among family and friends and also donated to the poor. 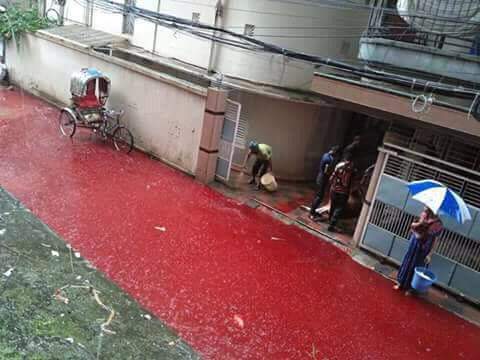 And the water turns blood red! Eid al-Adha 2016 was expected to begin on Sunday, September 11. But on Friday September 2, the supreme court in Saudi Arabia announced that the Muslim festival of Eid will be on Monday, September 12. In Asia, tens of thousands of people left Bangladesh’s capital Dhaka on crowded trains and ferries for their hometowns to celebrate the holiday with family and friends. And kill plenty of animals (goats and cows) leaving the blood running down the streets.